This 5 acre park is located directly behind Casselberry City Hall and the Casselberry Police Station on the bank of Lake Concord. 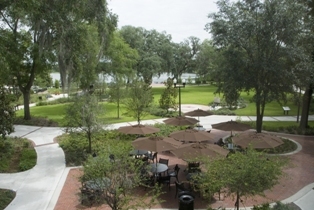 Home to Casselberry Jazz concerts and the Casselberry Art House, this park serves as the artistic and cultural center of the City. Lake Concord Park’s amenities include an interactive water play area, amphitheater, sculpture garden, playground, board walk, fountain and Florida native species of plants and gardens.